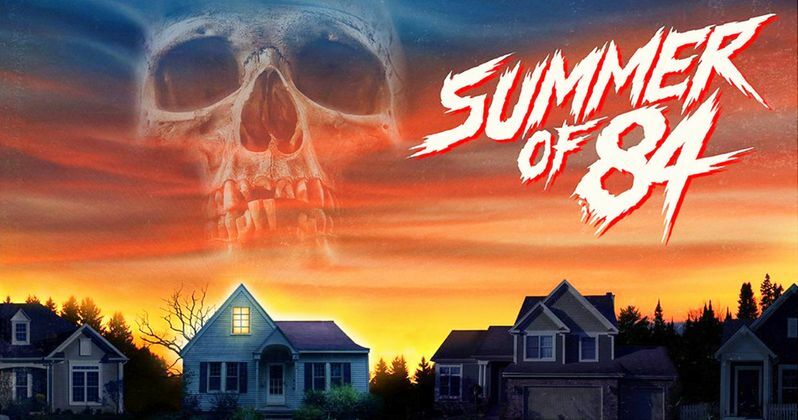 If you love Stranger Things, The Goonies, The 'Burbs, Rear Window and Disturbia, then you're going to love Summer of 84, as it pulls all these classic VHS tapes off the shelf and shoves them into a blender, pushing puree. This looks like a fun nostalgia bump, which will have you yearning for kids on milk cartons. And it's coming our way this summer. Summer of 84 looks like a good blast of scary fun. It comes from the team responsible for Turbo Kid. The collective calls itself RKSS, getting a directorial credit under that moniker, which stands for Roadkill Superstar. RKSS is actually made up of Rançois Simard, Anouk Whissell and Yoann-Karl Whissell, who may or may not actually be real, living breathing people. The movie is written by Matt Leslie & Stephen J. Smith. The ensemble cast is made up of young up and coming actors that include Graham Verchere, Judah Lewis, Caleb Emery, Cory Gruter-Andrew and Tiera Skovbye, with Mad Men star Rich Sommer as the cop suspected of murder. Here is the official synopsis. "Summer, 1984: The perfect time to be 15 years old and care free. But when neighborhood conspiracy theorist Davey Armstrong begins to suspect his police officer neighbor might be the serial killer all over the local news, he and his three best friends begin an investigation that soon turns dangerous." Summer of 84 will hit theaters on August 10. And it's sure to encourage plenty of kids to launch their own murder investigations in town. At the very least, it looks inspiring in all the right ways. Summer of 84 has already played Sundance. There it was met with mixed reviews. Many people compared it to Stranger Things, which itself is a culmination of every great movie from the 80s. "It's going to be a great film. The Summer of '84 is pretty explanatory by the title. These four boys all live in a neighborhood cul-de-sac. They each have a suspicion that their neighbor, Wayne Mackey, who is also a police officer, might be a serial killer. This prompts an investigation from the four boys into his private life and they start to dig in. The film really has a Stand By Me or maybe a Goonies feel. Stranger Things is set in the 80s as well. However, Summer of '84 deals with more real-life events. There's nothing like the "Upside Down" or anything like that. They're dealing with a real serial killer. I think it's a bit more grounded in reality whereas Stranger Things is definitely more sci-fi horror." You can check out the first trailer and poster for Summer of 84 courtesy of Gunpowder & Sky. It sure looks like a fun summer romp, and will be perfect to tide some fans over until Stranger Things Season 3 premieres next year.